Okay if you are not into carving your automata characters you don't need to read this. Characters cut from pieces are just fine. Enjoy yourself and move on to another page. 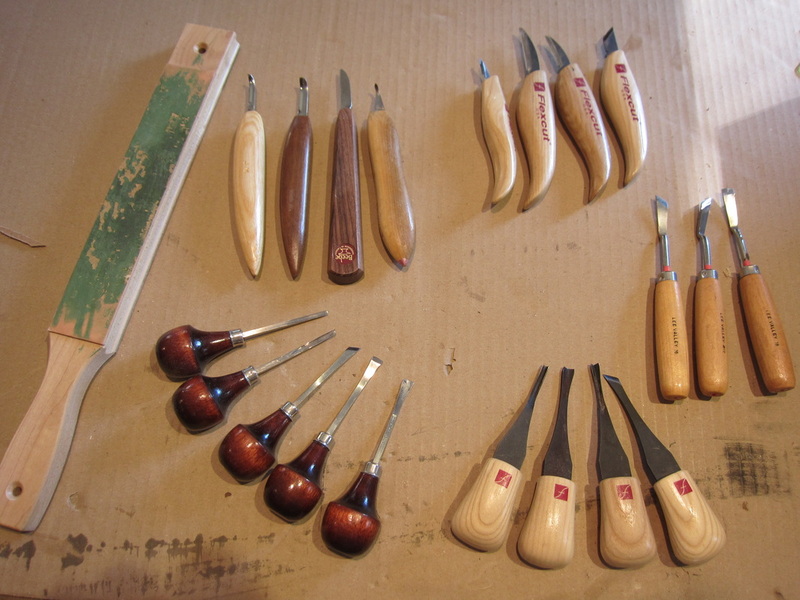 If however you wish to shape and detail things then there are a few carving tools you should think about. The first consideration is do you intend to just shape pieces? This can basically be done by whittling If you want to detail features such as faces, then you will need some carving knives of different profiles. Maybe you just want to power carve using a tool like a Dremel or Foredom. 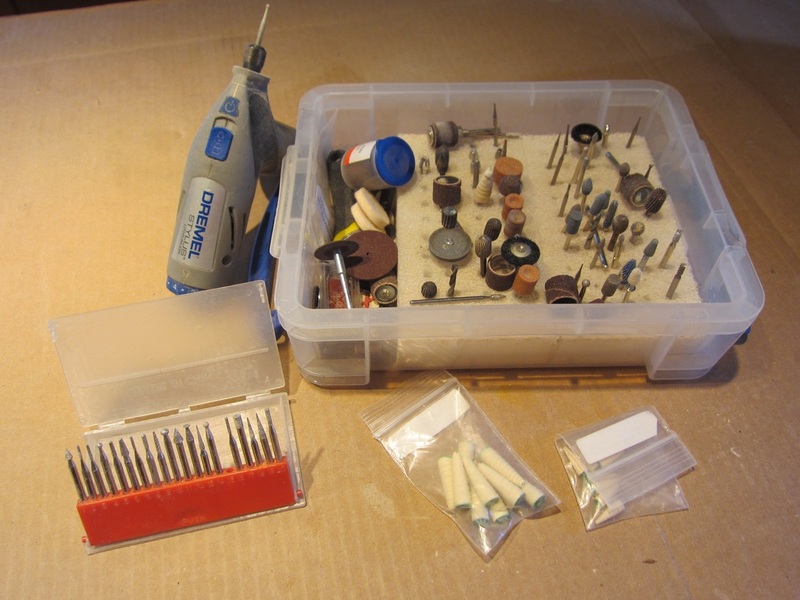 In this case you will need a collection of cutters, burrs, and sanding bits. Finally I will include pyrography in carving since i use it accent shapes, surfaces and "carve" hair, fur and fish scales. There is a lot to think about! If you hang around a carver you discover they usually have lots of carving knives, some hand me downs, some found rummaging in a garage sale or a few favourite you could,t resist. Like everyone else I have knives from all these categories. I do a lot of power carving with a Dremel tool. I usually Tupelo wood for small characters which machines very nicely. I have both battery operated and power Dremels, one powered one with a cable operated tool head. There are an assortment of burrs and tools available. I use atypic bit the remove large amounts of material. I might then move to a small sanding drum if applicable and then onto diamond burrs for smoothing. 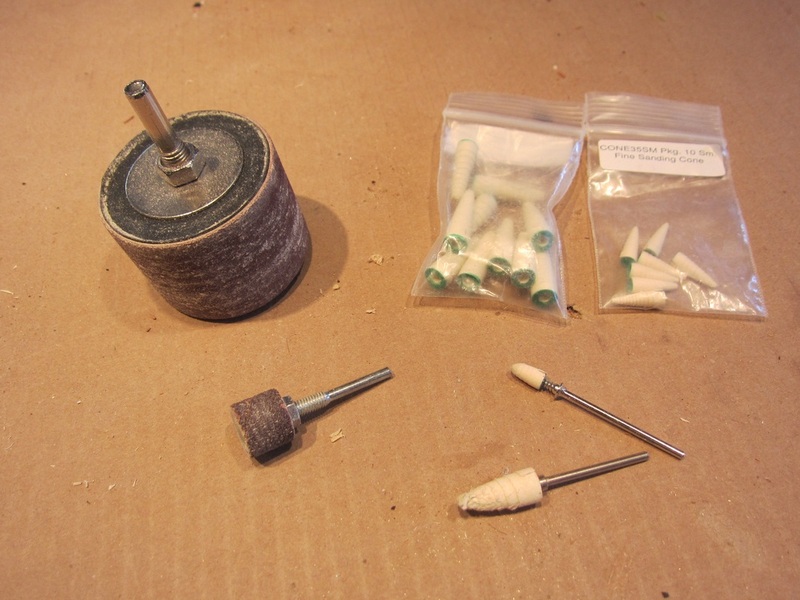 For a finer finis, and to remove any "hairs" from the work I use cone sanding tips as shown in the photo below. I often still use intermittent bits of hand sanding along the way.